It’s a page full of awkward Ikes and sad Anthonys! It sounds like maybe everyone will finally stop asking me about Ike and Manticores in the near future. Also dudes! 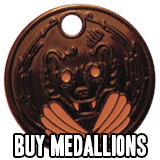 Did you notice that I have a NEW MEDALLION IN THE SHOP? 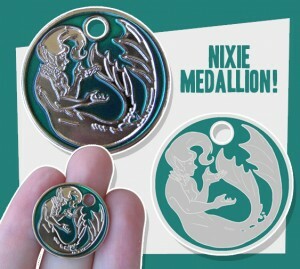 Nixie medallions for sale! They are GORGEOUS, kids! Really great looking. I took a gamble on the enamel and it really paid off. Also: do you like DESKTOP WALLPAPERS? 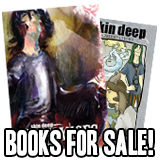 Because I am doing a donation drive right now and if you donate $1 or more you get a FANCY SKIN DEEP WALLPAPER featuring the ENTIRE CAST of Skin Deep! Just go look up on the sidebar to your right for details! Woo! It should also be mentioned that Ike and Remy (the lion in the first two panels) were created by Sheana Molloy! And Anthony, as always, was created by Sfé Monster! I approve of this awkwardness. I can’t wait to learn more about Ike because he is my favorite character I know next to nothing about. I really love all of Ike’s expressions on this page and how much more bestial his design is, in that his face is more elongated than those with medallions. Ike and Anthony will be FABULOUS new buddies! I can’t wait for him to cheer up! This looks like it could lead into an interesting conversation provided they can get over the awkwardness. Well, you guys have one thing to talk about, anyway. The fact that Blanche is a meddling meddler who meddles. Ahhh i’ve been waiting with bated breath and i am, once again, not disappointed. Blanche could have chosen someone who’s a bit better at this sort of thing. Unfortunately, since the party boy and his friends are otherwise engaged, Tim and Sam are presumably standing ready to intervene at the door, and nobody would want anyone’s parents showing up, it’s would have to be Newbie McNotbeenintroducedyet. Nah, there’s a reason Blanche wanted Ike in particular to talk to him. At the signpost up ahead your next stop The Awkward Zone! I love the expressions in the last panel so much that I actually bounced up and down in the chair and made little peep-noises of amusement. That’s a shame. It would have been nice if Ike really meant it. He would probably know the most how Anthony feels. At least that’s what I heard. I always feel incredibly impatient when I read the latest page of a webcomic. Comes to a point when you read through a webcomics archive and realize that the last comic was done two years ago and died mid arc. Nooooooooooooo! From 2018 Hiatus here. I feel you, buddy, I feel you. 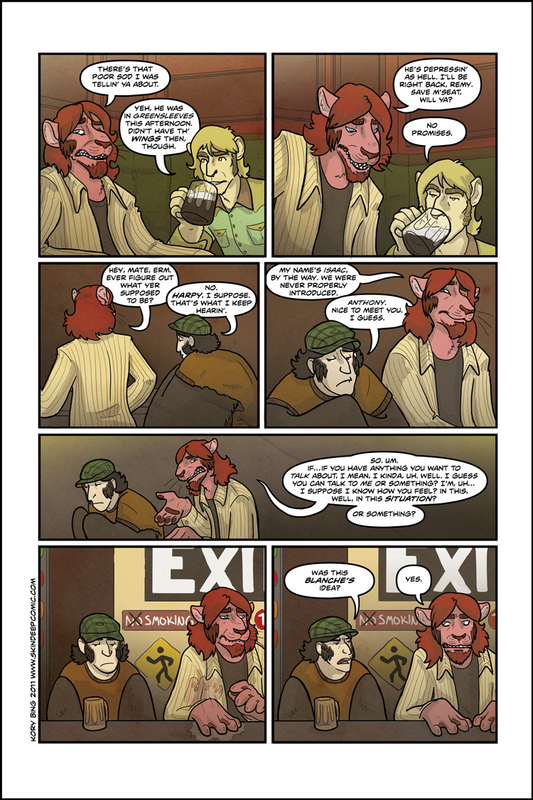 It just randomly occurred to me that Ike and Siobhan http://www.sylphxpression.deviantart.com/gallery/?q=siobhan#/d2yai36 who only stands up on her hind legs to dance BTW, might get along. Maybe I can draw some fanarts plz? Weeks and weeks of Anthony grousing! Let’s have some action! would love to see you start a (tv) cartoon with this comic. i think it would be a hit. do you go to furry conventions at all? which ones. FCN is coming up in April 2011.
if you have comic books made up you could sell them. I know this is late as anything, but I /just/ got what’s going on with Anthony. Someone tried to make a one-way spell to disguise monsters, and succeeded! Only, what with touching the medallion, the spell sort of didn’t hold up too well. That’s my take, at least.